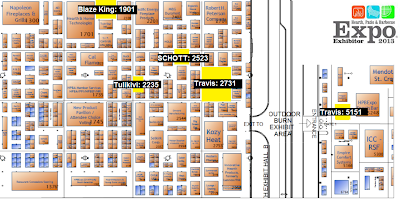 Going to the HPBExpo in Orlando March 13-16? Check out the booths of the Wood Stove Design Challenge finalists and meet some of the Organizers. John Ackerly & Melissa Bollman from the Alliance for Green Heat will be there as well as David Agrell from Popular Mechanics, the lead media sponsor. HWAM: Team Captain Steve Rhoades will be attending. Kimberly: Team Captain Roger Lehet may attend. SmartStove: Team Captain Dan McFarland will be attending. Tulikivi: Booth #2235. Team Captain Jeremy Johnson will be attending until noon on the 13th. If you plan on going to the Expo and would like to meet up, please get in touch with us through the email addresses above. Thanks! 1. They have put controls on "wood" stoves. They are called pellet stoves. 2. They don't need to. The marketplace is not demanding it, mostly because people don't know the technology is available. 3. It's a new technology. Wood stove manufacturers are dreadfully slow with adopting new technologies. 4. They don't use wood stoves themselves. The vast majority of upper management in stove companies don't heat with wood, so they don't understand the benefit of automation. 5. They're not being forced to. Why add complexity to a product that sells well and requires little support? Any new technology starts out in low volumes and is expensive. Stove companies are very cost conscious. 7. They can do the same thing with a bi-metallic spring. Bi-metallic springs do provide some measure of control. 8. It might require electricity. There is a perception in the industry that people who heat with wood don't want to plug in their stove. 9. They have other projects to work on, like pellet & gas stoves. The gas stoves are by far the products that ship in the highest volume, and pellet stoves are growing in volume. Wood stove shipments are flat, so they spend their resources on these other areas. Some manufacturers go years without making any significant changes to their wood stove line. 10. No incentives from the government. Unlike in Europe, in America there are no incentives for cleaner and more efficient wood stoves. There is no Energy Star rating or green label equivalent to reward customers for buying, and manufacturers for producing, the cleanest and most efficient products. 11. Not enough efficiency data. There is little data about actual efficiencies in the field over the course of a day of heating. Could 70% in the lab be 55% if averaged over the course of a fire? 12. Fuel is still relatively cheap. Fossil fuels are still relatively cheap and plentiful in the United States, and so is firewood. Postscript: Since we published this blog in 2013 there has been some minor progress toward including low cost sensors in stoves. MF Fire, a new company, released an automated stove controlled by sensors and SBI is developing sensor technology that hopefully will be in certified stoves in 2019. What do you think of the list? 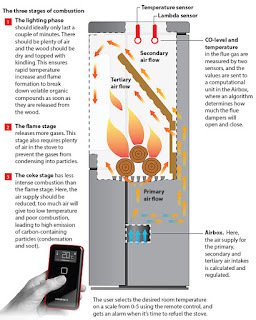 Are we forgetting any reasons why U.S. manufacturers aren't incorporating sensor technology in wood stoves? Leave your thoughts in the comments section below. 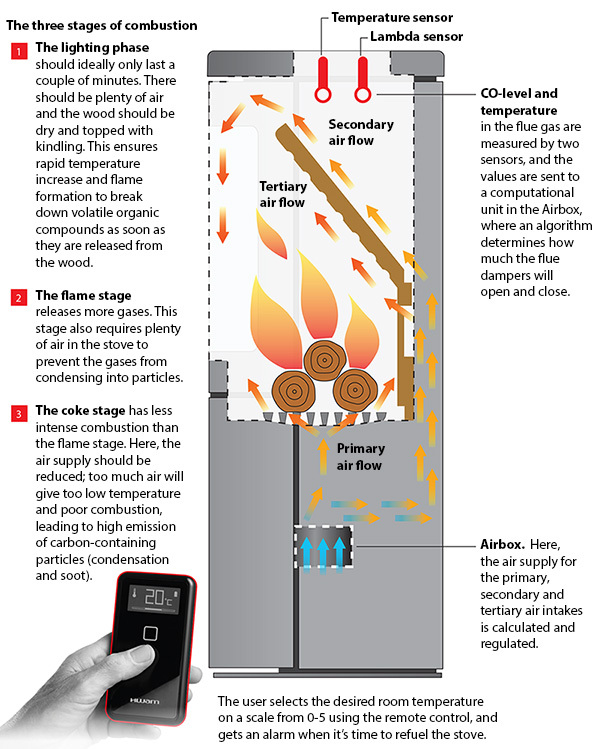 You can also check out our previous coverage of wood stoves and oxygen sensors here. 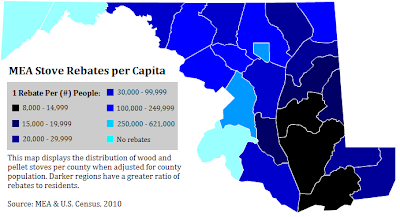 Alliance for Green Heat, February 12, 2013 - Initial data released by the Maryland Energy Administration (MEA) shows there have been more wood and pellet stove grants awarded per capita in the more rural and less affluent counties of the Eastern Shore than the more populated central region of the state. This provides some early indication that the Clean Burning Wood Stove Grant Program has succeeded in delivering more benefits to the areas it was intended to help. Both Somerset and Dorchester counties on the Eastern Shore had two of the highest per capita rebates and are both among the state’s poorest counties. The other striking trend is that Marylanders used the rebates for pellet stove twice as often as for wood stoves, defying national trends. “We are extremely pleased by these early numbers, showing that Maryland crafted a renewable energy rebate program that really works for average Maryland families,” said John Ackerly, President of the Alliance for Green Heat. The average cost of purchasing and installing a wood or pellet stove in this program was $4,180 and the majority of projects cost between $3,000 - $5,000. Five of the 78 projects to receive rebates cost less than $2,000 and 3 cost more than $6,000. The typical MEA stove grant covered between 8% - 20% of the total project cost. MEA launched the Clean Burning Wood Stoves Grant Program in September as a pilot program with $50,000 in funding. The initial $50,000 is gone, but MEA says they are extending the program indefinitely. If it were made permanent, it would join programs established for residential solar PV, solar thermal, geothermal and wind. The Clean Burning Wood Stoves Grant Program is innovative in that it only provides rebates to Maryland households heating with oil, propane or electricity and does not cover homes with access to natural gas. This has resulted in funds being focused on the half of the state’s households that uses the highest priced and most carbon intensive heating fuels. The initial data also shows that on a per capita basis, many of the rebates have gone to homeowners on the Eastern Shore, where natural gas is not widely available. However, the program has not yet shown the same results in Western Maryland where access to natural gas is also limited. Thus far, no household has received a rebate from Garrett or Allegany County, which are among the most rural and least affluent in the state. Of the 78 grants that have been paid, only 20 have gone towards wood stoves and 58 to pellet stoves. In most states, wood stove outsell pellet stoves by 2 or 3 to 1. The reverse trend in Maryland may have something to do with the higher rebate level for pellet stoves ($600 instead of $400). The popularity of pellet stoves in this program is a very positive sign that these families are using their pellet stoves as a sole or primary heat source and completely avoiding use of oil, propane and electricity for heat. Wood stoves are more likely to be a secondary source of heat or provide 60 or 80% of heat, whereas pellet stoves are more likely to provide 90% or 100%. The other notable and more predictable trend is that pellet stoves were most popular in counties with higher average per capita income. The most pellet stove rebates have been awarded in Anne Arundel and Harford counties, which are located in central Maryland and have higher median per capita income at $37,600 and $32,700, respectively. Counties with a median per capital income of $25,000 or less chose wood stoves as often as pellet stoves. 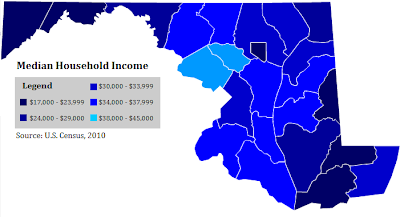 Median income in Maryland is $34,500, according to the 2010 U.S. Census. MEA is still compiling data about how many homes had wood or pellet stoves prior to buying a new, cleaner one with the rebates what they did with their old stove and what heating fuel was being replaced. The program only provide rebates to the cleanest stoves on the market. Wood stoves must emit no more than 3 grams of particulates per hour and pellet stoves 2 grams. Thanks to Kyle Haas at MEA for providing this data and managing the program. For more information on the program and how to apply for a wood or pellet stove grant, visit MEA’s site or the Alliance for Green Heat’s Frequently Asked Questions page. One page fact sheets are available for download here and here. Alliance for Green Heat, February 11, 2013 - A last minute attempt by a manufacturer to derail new outdoor boiler regulations in Utah failed. The State’s Air Quality Board passed innovative and balanced regulations that allow the installation of EPA qualified outdoor boilers in rural counties but ban them in populated counties that do not meet federal air quality standards. The regulations will take effect this spring. This makes Utah the latest in a string of states to regulate the outdoor wood boiler, the most polluting residential wood heating technology on the market. Utah went further than most states, banning their installation in areas that already have poor air quality and where about 2 million out of Utah's 2.8 million population lives. Utah is now the only state to adopt an installation ban on outdoor wood boilers in much of the state, but still allow their use in rural areas. Washington and Oregon have restrictions that effectively banned outdoor boilers in the entire state. Other states only regulate where they can be installed through property line setbacks. Many states require boilers to be set back at least 50 feet from the nearest property line. New York and now Utah require 100 feet. Maryland and Rhode Island are the only states with regulations limiting installs to EPA qualified units that have no property line set backs. An innovative feature of the Utah regulations addresses households that currently have outdoor wood boilers and now fall in the area where they are banned from installation. Those units are grandfathered, but families living in the banned counties can install another outdoor boiler in the future as long as it runs on pellets and is EPA qualified. The regulations also require a 1,000 feet setback from a school, day care center or hospital, which may be the strictest such clause in the country. 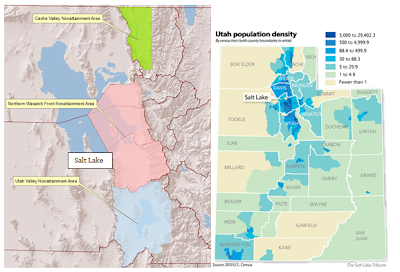 The maps below show the correlation between population density and the non-attainment areas in Utah. 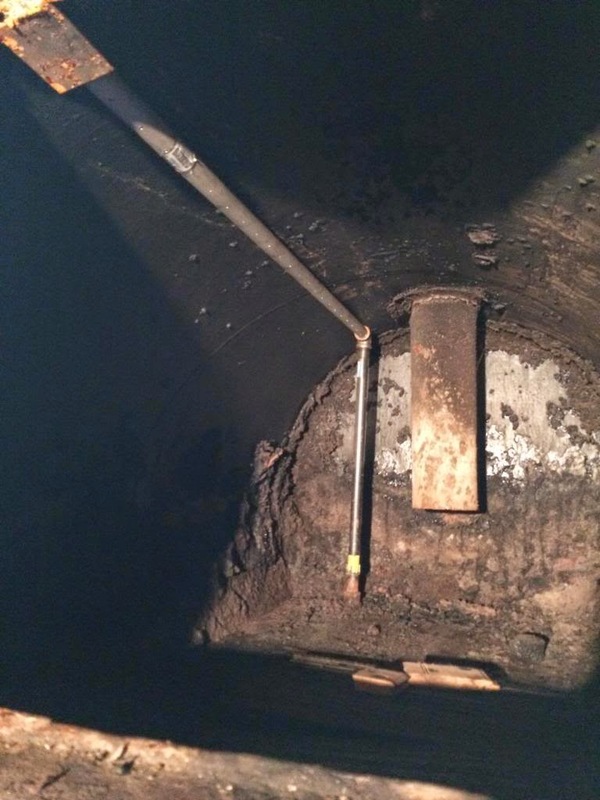 Central Boiler fought against Utah’s new regulations arguing that the rule "lacks scientific support and would unfairly prohibit Utah residents from purchasing and using clean-burning wood furnaces." A main thrust of Central Boilers argument is that Phase 2 boilers "are cleaner than EPA certified wood stoves." Specifically they claim “average emissions for a Phase 2 OHH [outdoor hydraulic heater, another name for outdoor wood boiler] are 77% less than those from EPA-Certified wood stoves." The full submission by Central Boiler can be found here. The Alliance for Green Heat supports regulations in all states that only allow the installation of Phase 2 qualified outdoor boilers and, like Utah, have setbacks or other regulations to prevent their installation in densely inhabited areas. Click here for an overview of state outdoor boiler regulations. Alliance for Green Heat, February 7, 2013 - The hearth industry, the Alliance for Green Heat and scores of other institutions and companies have been incorrectly stating that the Internal Revenue Service (IRS) provides a 10% tax credit up to $300 for qualified biomass heaters. In fact, the IRS provides a tax credit equal to expenditures up to $300 for qualified stoves. This means every qualified stove purchase will receive the full $300 unless the taxpayer already claimed a similar credit of $500 in a previous year. The confusion arose because one set of energy efficiency improvements under 25C of the tax code are only entitled to a 10% credit up to a set amount. However, taxpayers who purchase biomass stoves are eligible under 25C(a)(2), which provides that qualified residential energy-efficient property may be eligible for a tax credit equal to the full cost of the equipment up to a set amount, which is $300 for biomass stoves. Taxpayers filing with companies such as Turbo Tax, H&R Block or other tax preparation software should receive the full $300. While the error of stipulating that only a 10% tax credit is widespread among hearth retailers, manufacturers and others, it is unlikely that any professional tax preparation software would calculate the credit incorrectly. The difference to taxpayers is substantial. For example, a $1,500 stove would only allow for a $150 credit, if the 10% provision applied. Click here for a copy of IRS form 5695 to claim the tax credit. A biomass stove purchase would be claimed in line 24 of form 5695. For more information, visit our blog and this authoritative site: www.dsireusa.org/incentives. The Alliance for Green Heat promotes biomass heat as a low-carbon, sustainable, local and affordable heating solution. The Alliance is a non-profit Maryland organization and is tax-exempt under section 501c3 of the tax code. For more information: www.forgreenheat.org. In May 2010 the Alliance for Green Heat wrote to the IRS, urging them to look into the matter of unqualified outdoor wood boilers claiming to be 75% efficient. The Alliance had found one manufacturer, Shaver Furnaces, who had certified their unqualified boilers as 75% efficient lower heating value (LHV) allowing customers to claim what was then a $1,500 tax credit. Over a year later, the IRS issued a ruling, finding that Shaver Furnace “failed to meet the efficiencyrating of at least 75% as measured using a lower heating value.” The IRS revoked the companies right to provide a certification on which future purchasers of the furnace can rely. The ruling did not impact the ability of Shaver consumers to take the tax credit prior to the date of the ruling, Nov. 28, 2011. It does not appear that the IRS imposed any fine on Shaver. The Alliance for Green Heat is not aware of any other manufacturer who has been denied the right to claim 75% efficiency, but has been very critical of the industry practice that allows virtually every wood and pellet stove to claim 75% efficiency. In reality, wood stoves that claim 75% efficiency may be below 65% efficient LHV and some pellet stoves are under 60% LHV, with some even under 50%. "Since the Shaver can burn larger pieces of wood it will dramatically reduce the time loading the furnace and the time spent cutting the wood - and there is no splitting. Plus the wood burns better and more completely. Costs for large round pieces are also significantly less than for shorter pieces of split wood..... Once the water heats up to the temperature you set it at, the fan goes off, allowing the fire to just smolder."